Students were invited to spend the whole night working on campus last Thursday during the Long Night Against Procrastination. This was the Writing Centre’s third year holding the event, which is meant to provide students with a space to work on assignments with the nearby help of tutors from 8 p.m. to 8 a.m.
Boba Samuels, manager of the Writing Centre, writing consultant Jordana Garbati, tutors and volunteers set up the event in the 24-Hour Lounge. According to Samuels, this event took months of planning for the Writing Centre. “Our tutors are very enthusiastic at the moment, they’re excited to be here and they’ve been waiting months for this event,” said Garbati. Although the event ran similarly to past LNAP events, this was the first year LNAP has been Canada-wide. 14 institutions from 17 locations, which included the University of Waterloo and McMaster University, hosted the event all on the same night. The hashtag #LNAP14 was used on Twitter to share what other schools were doing overnight. “It’s the first year Canada-wide so we hope to get a lot of positive feedback across the country,” Samuels said. Last year’s LNAP had more than 200 students from business, chemistry and the faculty of arts come in to work and study all night. This year had around 125. According to Garbati and Samuels, the Writing Centre has interest in planning another LNAP in the spring, but don’t have the funding or the time to do so. 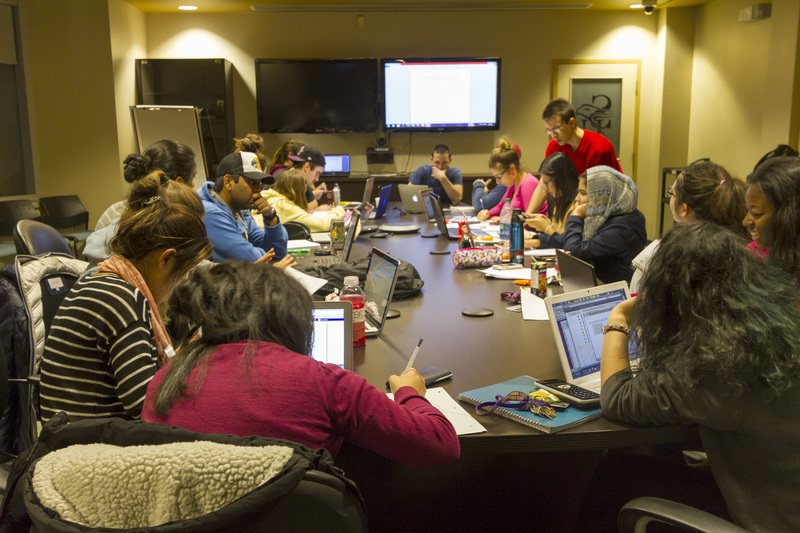 More changes to this year’s LNAP included midnight pizza from Panago and work groups that ranged in programs from sciences to arts. Like other years, though, students continued to have the option of leaving at anytime or staying until 8 a.m. when the “Survivors’ Breakfast” was served. Writing Centre tutors Lindsay Meaning, a third-year English major, and Connor Young, a fourth-year anthropology student, attended LNAP to help students work on their papers as well as edit their own work. This was Meaning’s second year volunteering at LNAP, while this was Young’s first. “Every year we start planning for it and thinking about what we’re going to do to make the students experience special,” Meaning said. “I think it’s a cool idea because a lot of students, especially at this time of year, have a lot of trouble fitting everything in and this gives them an extra incentive to actually be productive rather than going to bed early,” Young said. According to Garbati, her impression from reports of individual LNAP events is that tutors, students and staff had a fun and productive evening. “If all goes well, nationwide LNAP events will continue in the years to come,” she said.